Toronto’s histoy dates back to 1615, when Etienne Brûlé arrived on a mission for a French explorer, who had already founded a settlement at Québec. This discovered land, became known as Toronto, a name that may have been derived from a Mohawk name for a sacred fallen tree. After years of hostility with the French, the British took over Toronto, under the 1763 Treaty of Paris. In 1793, the provincial capital was moved from Niagara-on-the-Lake to a more defensible position at Toronto, now renamed York. During the War of 1812, the Americans forces overcame the British and razed York. The 1814 Treaty of Ghent ended the hostilities between the USA and Canada the city began to expand. 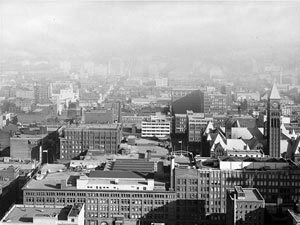 Throughout the Victorian era of the late 1800s, there was seemingly nothing but progress for Toronto, though; there was a 'Great Fire' in 1849 and another in1904. But, after this the city was rebuilt and became known as 'Toronto the Good'. After WWII, thousands of European immigrants rolled in, bringing the city new languagues, customs and food. It began to show signs of the cultural diversity that has become Toronto's trademark. The Yonge St subway line opened in 1954 and Toronto expanded in every direction, inviting more immigrants and emerging as the great global city it is today.